After I blogged last week about the NOC issue and changing jobs here in the Sultanate, I received two emails, one from someone I know in recruitment, and one from someone I don't know - and this email I'm copying here for all to read. Because, it seems that there is some misinformation on the issue of a NOC and how to change jobs out there, I've also, it appears, gotten the wrong end of the stick with this NOC issue. As you will see from the email below, there is no reason why an employer shouldn't issue a NOC (no good ethical reason at least) as it appears that once an expat leaves the country and has their visa cancelled, as long as their new employer has a labour clearance, your old visa is cancelled - and the old employer can then re-apply for a replacement visa clearance. There were and still are 2 ways of changing jobs in Oman.The common thread between the 2 is that the new employer has to obtain a clearance for your employment. This is the key requirement as there are multiple documents that have to be submitted by the new organization to secure your clearance proving that an expat is required and the role cannot be filled by an Omani (at least not to date). This is a very important document for any expat to get a visa. Now, what I was given to understand, a clearance issued is valid for 15-18 months before which it must be assigned/ issued to an expat. Once assigned to an expat, it stays as long as the expat is in the country. If the expat leaves the job after the initial 15-18 months, the clearance just expires. Why this is important becomes clear in the next part. The second process used to be called transfer. Here the exisiting employer used to fill up and sign an official form and this used to be submitted by the new employer in the ministry transferring the clearance and visa to the new employer. In this case the expat simply stayed in the country and everything was done locally. This is now called a RELEASE. In case the existing employer now issues a Release, he loses his clearance. But, if the new employer has a clearance already and the employee has already completed 2 years, the existing employer still retains the right to ask for a new clearance (not a replacement clearance). This is where the trouble starts. The new clearance takes anywhere between 3-6 months. Just the amount of time it takes to get either a Replacement or a New Clearance is what spoils the intentions of the existing employer. But none of this is properly ever communicated to people and some organizations take their employees for a ride. In most cases, the existing company never loses a clearance or the right to apply for one. It is just that they do not want the employee to leave to competition. The fact that the media or relevant people never highlight this process properly gives everyone a wrong picture. So - if you leave Oman, and cancel your visa, your employer can apply for a replacement clearance once your visa is cancelled, and should therefore have no problem with giving you a NOC once you've had your visa cancelled. Well that changes things a bit doesn't it? It actually doesn't change much. The one word you can pick up on in this blog post is 'ethics'. Unfortunately, we live in a country where ethics really does take a back seat (in a 7-8 seater MPV). Employers know most of what you've written already, however, they are using the laws in place to stop employees leaving out of spite or some sort of complex. I know someone who has been stagnant in a job for 8 years with little progression, she is a lady, so doesn't have the option of easily moving to another job as womens' clearance is not easy to get. Even if she could move however, her company has told her she can rot here or leave the country for two years as they'd never give her an NOC. So employees are left at the mercy of their employers wishes. 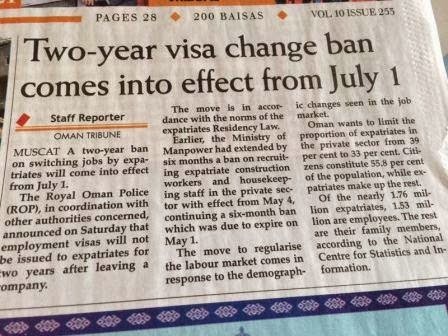 It is pretty pathetic, but this is a widespread occurrence in Oman since the rule was put in effect. The employers have used the "change" announced last June to cause confusion, deny employees an NOC and at times extort money or force them to stay at the job. The government's failure to clarify things publicly makes them complicit in all this. Until the government makes an official statement clarifying the process, employers will continue to inflict fear and extort employees. If employers don't want to wait the 3 months without a staff member, then they should require a 3-month notice from employees in their contracts like some other companies do. What happens, particularly in SME, is that staff get a generic contract whose stipulations are never followed so staff really don't know what is legal or illegal (i.e. People don't get two days off, aren't paid for overtime or are asked to work at the company and the employers personal home). does the NOC need to state the name of your new employer? - If you leave with the intention to come back later.. but don't have a new job yet it is nice to get an NOC while your present employer approves and can be bothered. Someone told me you need the name of the new company on there. Is that true? I plan to leave for 6 months then come back and lok for a new job. Is an NOC without a new company name valid? Someone called this an 'open NOC' - and says its not valid. News to me. I just requested an NOC from my old employer in Oman and it was issued without any question. It definitely does not affect their ability to get another visa allocation. I was surprised how easily it was given, especially since I now work for the same company in Saudi Arabia! As to whether an employer will withhold an NOC simply because they don't want the employee working for a competitor or just want to A**holes, that's depends on the individual circumstances. This is more or less what wrote in my comment on the previous post. Thanks for your efforts in confirming it and explaining it in better way. Did you mention " (no good ethical reason at least)"???? thats the main point, employer has the chancw to stop u.. so no increments. no promotion.. and u end up demotivated..keep working like that... we are losing ourselves... we need to go out as soon as we get chance..
Just one question if you read this... is there anything we can do if employer refuses NOC without any reasons? please advise. I read carefully and walk through all points. Your words are really appreciated. But i have a doubt about NOC Process. If i get a NOC letter then my sponsor need to visit Emigration for submitting NOC or other things regarding the NOC subject. I heard like this from outside. Waiting for the kind reply.